Scratchy throat, watery eyes? Yes, the vog is making things uncomfortable and we can blame the southerly winds. 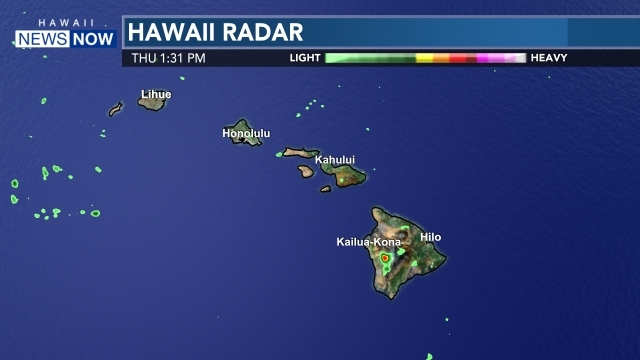 Dan is tracking conditions and will let us know when the trades will push out the stubborn vog. We're getting word of a power outage affecting about 5-thousand customers on Molokai. It's reportedly due to a pole fire near the power plant in Palaau. Updates ahead on Sunrise. A reminder if you want to vote in the general election. Today's the deadline to register. Ramsay will have important information on Sunrise from the Office of Elections. You'll find all the campaign 2012 details you need to know at HawaiiNewsNow.com. Four days from now, the pilgrimage begins for the canonization of Blessed Marianne Cope. I'm hitting the road with videographer Peter Tang to cover Blessed Marianne's Road to Sainthood from Molokai to Syracuse to Rome. My special reports begin tonight on Hawaii News Now at 6. A preview's ahead this morning on Sunrise at 6:10. We're following a critical crash in Kaimuki. Two people had to be hospitalized after a woman driving a smart car didn't make a complete stop and a motorcyclist slammed into her. It happened near 6th Avenue and Kilauea around 7:30 last night. Another bad break for Joyful Garden Chinese Seafood Restaurant in Kaneohe. One year ago, an arson fire damaged the restaurant and yesterday, a man in a truck accidentally hit the gas pedal and crashed into the VIP room. Luckily, it was vacant and no one was hurt. Let the battles begin! Starting tonight, the Voice contestants face off in dramatic sing offs and this season, there's a twist. Competing coaches can still singers. This morning at 6:50, we'll hear from coach Ceelo Green and host Carson Daly about the battle between contestants and coaches to win it all. Plus, see what's trending this morning, including a crash that puts the nasty in NASCAR and who's just been named Sexiest Woman Alive.